It can be difficult to adjust when you leave familiar surrounds for better opportunities. It can be doubly difficult when those adjustments involve leaving your friends behind, as you accept a scholarship to a prestigious and exclusive school for girls on the other side of the city. This is exactly the dilemma that fifteen-year-old Lucy Lam faces when she wins the inaugural Laurinda Equal Access Scholarship. The award, which is designed to give a student from a disadvantaged background the chance to attend a private college, allows Lucy access to greater academic opportunities and a chance to work her way up and out of her lower socio-economic status. But it also means that she is thrust into an unfamiliar world, where wealth and power outweigh kindness and integrity, and every day is a struggle to survive against the passive-aggressive influence and bitchiness of her peers. Coming to Australia with her parents as a ‘boat person’, Lucy has a completely different life to those of her new classmates. While most of the Laurinda girls have never wanted for anything, Lucy and her family have had to work hard for everything they have. Their modest little house of only two rooms is located in one of the poorest suburbs of Melbourne, her father does factory shift work for Victory Carpets and her mother makes designer clothes in their garage to help support his income, all while looking after their infant son. Most of Lucy’s old school friends come from refugee backgrounds, and they face hardship every day, yet they are determined to study hard and get themselves (and their families) into better circumstances. Attending Laurinda gives Lucy this chance, but, after spending time at the school, she learns that being wealthy is not necessarily something to aspire to, especially when it means that your sense of self is compromised. 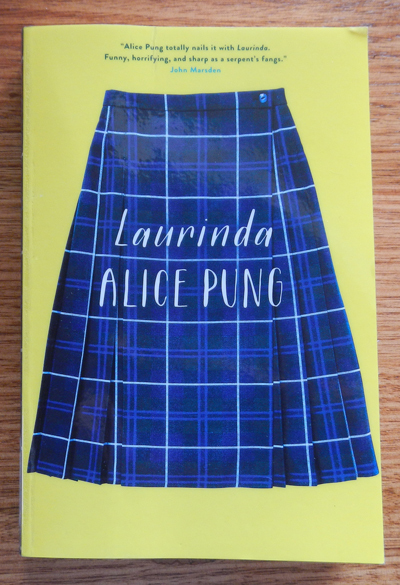 Set in suburban Melbourne during the 1990s (although fictional suburb names are used), Lucy narrates her story to feisty and brave Linh, and highlights the vast differences in her world. Nowhere is the vast socio-economic divide more prominent than in the school system, where, as a scholarship recipient, Lucy is treated more like a charity case than a worthwhile student. But Lucy is determined to make her mark, and when the Cabinet (a trio of popular and influential girls) decides to adopt her as their pet project, Lucy decides that this is her chance to show that a girl from the wrong side of town can still make something of herself in this strange new world. A little bit Mean Girls and a little bit Looking For Alibrandi, this book about one girl’s struggle to be true to herself is sure to win a legion of teenage fans.